Focusing existing IT resources in areas that add growth to the bottom line has become a top challenge for IT organizations. According to IDC, companies are spending over 90% of their budgets in maintaining and managing the existing environment. Only about 5-10 percent are actually used to drive things like new customer offerings , additional transaction models and business growth. Shortages on skill and resources create additional challenges. This Web seminar wants to show ways that allow you to shift resources to higher ended growth domains while pooling day-today-maintenance and administration in a new flexible way. 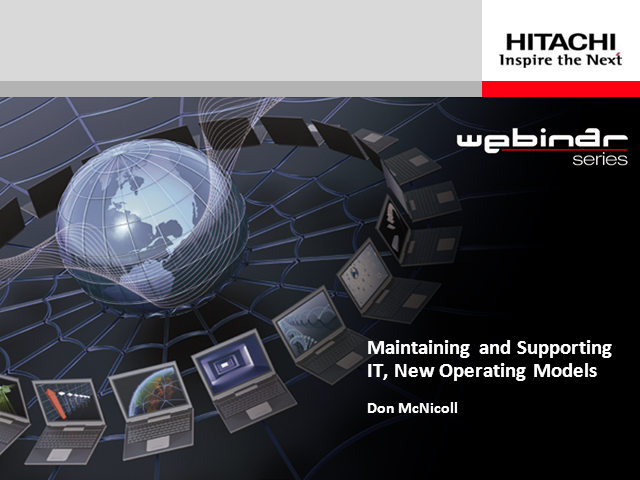 Find out how to build and use your cloud to support your businessâs objectives. Learn about new HDS cloud solutions and services that help you create clouds for infrastructure, content and information. Simplify and accelerate your transition to the cloud. Improve your competitive edge and build a foundation for future innovation. â¢Gain agility and react faster to the growing and changing needs of your businesses. â¢Reduce operational and capital costs through a flexible infrastructure that supports cloud delivery models for IT. â¢Simplify and accelerate the adoption of private, hybrid and public cloud with an integrated portfolio of Hitachi cloud technologies, solutions and services. Healthcare providers today are experiencing ever increasing data growth and demands for improved services and clinical workflow. Clinicians are demanding faster and simplified access to patient related data, regardless of their location or the data source. IT departments are being asked to manage increasing complexity whilst being asked to provide greater performance and improved service levels in the most cost effective way. There is a definite need therefore for improved automation, simplified information management to address the challenge of doing more with less. Healthcare Organisations are therefore looking for innovative ways to maximise the efficiency of their existing information infrastructures, whilst at the same time deploying new technology where cost & value can be justified. - Increased IT agility to limit financial impact of changes and improved planning for future upgrades. The promise of Cloud and the reality of the deliverable today provide organisations with a new set of choices when establishing an information governance policy for the future. Driving value and intelligence from the data which must be retained, and that which organisations choose to retain, is key to future profitability, economic efficiency, service provision and competitive edge. Big data, analytics, discovery and content repurposing are all clear objectives now and for the future. Our EIG service provides effective management of information ensures that the right information is kept for the right period of time in a manner that guarantees its availability, confidentiality and integrity. Hitachi Data Systems provides you with a cost-effective end-to-end compliance solution, from strategy to implementation. As labour and skills are fast becoming the most sought after resource in the data center, we want to show you examples of how some of our customers cope. Remote Operational Services from Hitachi Data Systems are provided by fully certified team members who help you improve overall efficiencies, meet service level objectives and better storage infrastructure investment. This will allow you to focus your scarce resources on the important bits of your business. Listen to Trevor Williams - Global Product Manager, Managed Services - and learn how other companies are using these services to their advantage. Hitachi Data Systems et Microsoft ont établi un partenariat stratégique qui a abouti à la mise au point de plusieurs solutions convergentes qui vous aideront à tirer le meilleur parti des systèmes dans lesquels vous avez investi. Grâce aux solutions Hitachi basées sur Microsoft Hyper-V Cloud Fast Track, vous pourrez rapidement déployer des machines virtuelles Hyper-V, d'une manière simple et automatisée, sécuriser vos données et évoluer facilement pour accompagner votre croissance. Les solutions Hitachi pour Hyper-V Cloud s'inscrivent dans une stratégie globale de solutions de Data Center convergent alliant la disponibilité exceptionnelle du stockage Hitachi et la puissance de calcul élevée des serveurs Hitachi , et les associant aux éléments réseau appropriés. Les solutions de Data Center convergent Hitachi sont disponibles dans différentes configurations et avec un plan d'action pour vos opérations d'automatisation et d'orchestration futures. Vous êtes libre de choisir les éléments de cloud qui conviennent le mieux à vos besoins actuels et de progresser à votre rythme. As virtualization becomes more pervasive across the data center, the tight integration between virtualized servers and storage becomes increasingly important. Manage and protect information across your entire VMware virtualized infrastructure to provide agility and seamless scalability for virtualized environments and reduce operational costs. Offloading storage intensive processes from the VMware vSphere 4.1 environment to Hitachi storage enables significant improvements in VMware performance. It can dynamically scale from hundreds to thousands of virtual machines on a single amalgamated tiered storage infrastructure to keep your environment streaming. This is supported on the Hitachi Adaptable Modular Storage 2000 family and the new Hitachi Virtual Storage Platform. Discover the key challenges that currently prohibit clinical information sharing; and how these act as a barrier to information integration and access. Interoperability is a critical piece of any hospital’s Electronic Health Record strategy – one which relies heavily on consolidation of patient information necessary for physicians to make well informed patient care decisions. Effective Electronic Health Record implementation requires consolidation of different departmental systems in order to adequately access the longitudinal record. There are strong drivers for interoperability of patient data; storage virtualization, consolidation and metadata-based open repositories are key enablers to help achieve this. Backup is critical to protecting data and ensuring its recoverability. However, backup applications, by design, continuously create new copies of the same data, resulting in an explosion of required storage capacity on tape and disk. The HDS & FalconStor data deduplication solution integrates seamlessly into your backup environment to address this problem, slashing media costs, streamlining management tasks, and minimizing the bandwidth required for replication. Data deduplication improves efficiency and saves money—exactly what is needed when IT budgets are tight. The deduplication solution includes disk mirroring to protect against local storage failure as well as replication to protect against disasters. The solution also includes a failover capability, which lets you recover data and respond to business requirements even if multiple nodes in a cluster fail. This same clustering approach allows you to scale to meet growing capacity and performance requirements while enhancing the overall deduplication efficiency. Clustering enables separate FalconStor VTL devices to be managed and used logically as a single data repository, supporting even the largest data requirements. Under conditions of shrinking budgets, organizational change and increased competition, enterprises are being challenged to make information both available and secure while their IT organizations are asked to do more with less. Join Bob Plumridge, CTO at Hitachi Data Systems EMEA & Chairman for SNIA Europe discussing his thoughts on transforming IT for the future and how Hitachi are solving the industry’s most pressing challenges with their approach of one platform for all data, coupled with their leadership in virtualization technology. He will discuss the latest major steps toward transforming the way companies implement IT and turn their raw data into valuable information that offers scalability and adaptability for the future. As CTO for Hitachi Data Systems Bob is responsible for aligning technology vision with business strategy and evangelising this vision to the press, analysts and existing and potential customers. With over 30 years experience in storage, Bob’s expertise is both wide and deep having worked in many roles in the industry from Field Engineering to Technical Product Support through to his present CTO role.Bob has worked for a variety of companies including ICL, Memorex Telex and EMC prior to joining HDS in 1988. Also Bob is currently the Chairman of the Board of Directors of the Storage Networking Industry Association (SNIA) for EMEA. Hitachi Data Systems has seen significant take-up of its Virtual Storage Platform (VSP) and Hitachi Command Suite 7.0 (HCS) since the launch in September 2010. The 3D scaling and automated dynamic tiering are assisting customers to meet increasing workload requirements in both open and mainframe environments.